Tai Chi is an ancient Chinese system of slowly flowing movements and shifts of balance that strengthens the legs while conditioning the tendons and ligaments of the ankles, knees, and hips, increasing their range of motion and making them more resilient, less prone to injury. The continuous flowing movements of Tai Chi are based on the principle that running water never stagnates. The gentle movements relax your muscles and joints while strengthening your body. Through movement and meditation, Tai Chi brings you health of body and peace of mind. Tai chi is a form of exercise that can improve muscular strength, flexibility, and aerobic fitness, as well as having additional health benefits. Tai Chi… reduces some stress hormones– Tai Chi uses calming, structured movements to counteract the stress of living in today’s fast society. An over-stressed mind makes errors and interferes with the healthy functioning of the body. Your mind and body will begin to rest thoroughly in the tranquil state that comes with Tai Chi practice. Improves balance – thereby reducing the risk of falling (the leading cause of death by injury in older folks). According to The Mayo Health Letter (February, 1998) – “In recent years, a gentle form of ancient Chinese martial arts, called tai chi, has gained attention as a method for improving balance… reduced their risk (of falling) by about 40%.” Tai chi movements emphasize the importance of weight transference, which is an essential component of good balance. Having good balance is important for falls prevention. A daily dose of Tai Chi might help you to inject some balance into other parts of your world, whether in work or at home, that need some balance. Increase oxygen levels and ease breathing difficulties– Most people think that aerobic exercise is necessary to strengthen the heart and the lungs. While aerobic exercise does accomplish this, so does Tai Chi. Slow, deep, regular breathing and energy movement combine to work oxygen deeper into the tissues than regular exercise. The deep breathing induces bodily and mental calm as the nerves of the Central Nervous System are soothed. Shallow rapid breathing can lead to tension and sometimes feelings of violent anger. The blood is circulated without stress on the heart: Concerning the circulation of blood, the object of Tai Chi is not to make the heart pump more strongly, but to increase the elasticity of the vascular system so the heart doesn’t need to pump as strongly, which provides it with more rest. Tai Chi is a physical exercise that focuses the mind, while conditioning the body. Practicing twenty minutes a day dissipates stress and reduces stress-related debilities, increases stamina, and strengthens the body and will. Experts say it provides resistance to disease, provides energy and enhances the function of internal organs by strengthening the immune system. The lymph fluids are moved primarily by tiny muscular contractions. The relatively fine muscular contractions improved by Tai Chi move lymph efficiently through the entire system and release the T4 white blood cells that help mop up invading pathogens. These actions, as well as the overall increase in energy that Tai Chi brings, strengthen the body’s immune response. Adds flexibility to the joints- Tai Chi works with the synovial fluid by compressing and expanding it, preventing and reversing all sorts of joint problems. Synovial fluid is found in the joints. It lubricates the joints, allowing joint flexibility, and when functioning normally helps prevent arthritis and rheumatism. The muscle tissue gains elasticity: Tai Chi also causes muscle tissue to elongate. With the stretches of Tai Chi the muscles eventually attain a state akin to that of a springy rubber band. This springiness is Tan Xing, it keeps you young. Tai Chi loosens the muscles and builds power: Tai Chi works with the muscles quite differently than typical exercises do. Tai Chi and other internal exercises build effortless power and looseness; the goal is a feeling of relaxed power. Relaxed power comes when the muscles just loosen up and allow the energy to flow through. 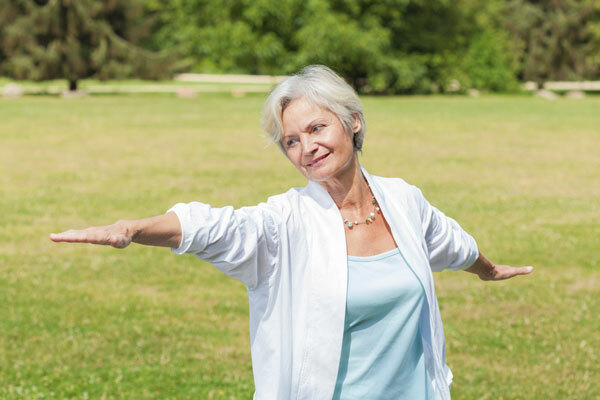 Leads to improved posture and relief of back pain – Tai chi emphasis’s correct posture, which has benefits for falls prevention, as well as decreased pain and stiffness of joints and muscles. The initial posture of Tai Chi helps re-educate people about their natural alignments; the ones they had as a child. Regular practicing of Tai chi brings about heightened general awareness-Tai chi also enhances clarity of the mind and improves mood, which also has positive benefits for your body (eg, a negative mood and pain have been shown to be related). Tai Chi is beneficial for all especially, women suffering from heart conditions, blood pressure problems or arthritis stand more to gain. Stiffness and pain from arthritis can contribute to poor balance. Regular tai chi practice can significantly increase flexibility, balance and coordination, especially among the elderly. This is particularly good news for older people or for those with osteoporosis who may suffer serious injuries from a fall.